The board of directors and staff of the California Budget Project (CBP) express heartfelt condolences to the family, colleagues, and friends of Lark Galloway-Gilliam, who passed away earlier this month. Lark dedicated herself to working for social and economic justice in her native Los Angeles, on the state level, and nationally. 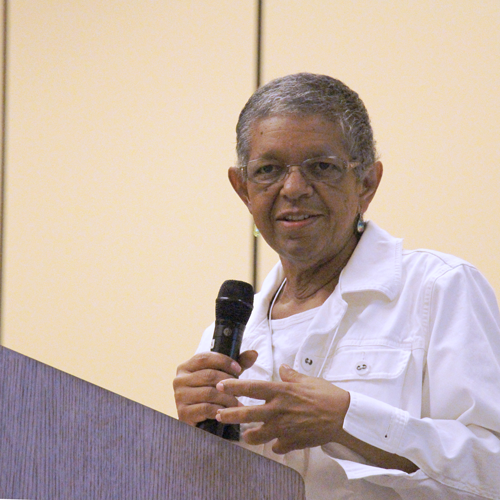 Although Lark had numerous leadership roles during her career, she is probably best known as the founder and executive director of Community Health Councils, Inc. Since joining the CBP board of directors in 2001, Lark had been a guiding voice in our efforts to advance public policy outcomes that reduce poverty and inequality and create opportunity for low- and middle-income Californians. Anybody who worked closely with Lark was impressed and inspired by her intelligence and commitment. As a way of honoring Lark, I wanted to share a few reflections from CBP leaders — past and present — on her immeasurable impact. The California Budget Project family will greatly miss Lark, a visionary and remarkable leader. We will remember her deep commitment to independent analysis and informed debate, and her passion for improving conditions for California’s families and communities. We honor and celebrate her many contributions, which will live on in our future work. This entry was posted on Tuesday, December 16th, 2014 at 12:50 pm and is filed under Health, State Budget. You can follow any responses to this entry through the RSS 2.0 feed. Both comments and pings are currently closed.